I guess you could call them side dishes, but I think that’s a major underselling of these intense punches of spice and salt. Plated on the table, banchan are edible pop art, and a gesture of Korean generosity. They’re the dishes that come with any meal you order in a Korean restaurant. Because a restaurant will offer different combinations and variations on any given day, it’s hard to get your head around banchan. You don’t need to order it by name, and often raw versions of edibles like gobo root and weedy fern bracken look nothing like their raw counterparts. I have often resorted to calling the dishes “little fish thing” and “stinky tofu strips” and then lumped all the spicy, red items together into a generic kimchi bucket. So there’s no shame in others doing the same. Nevertheless, curiosity and a personal mission of trying to identify with my roots impelled me to embark on creating a modest banchan primer. I simply wanted to identify each banchan dish and remember its Korean name. What I learned: There is an organizational structure to banchan. Styles are based on preparation and/or cooking methods – and once you’ve broken the dishes down into categories, you find that those tiny trays of spicy-this and pickled-that don’t seem quite so random. The most important of all banchan is kimchi, the national dish of Korea. Though there may be heavy rotation of the other types of banchan, you will always find kimchi on the table. Usually, at least three types are offered. Some say at least 100 kimchi variations exist, but the alchemical process that unites this pickle starts with the same fundamental ingredients: salt, sugar, hot red pepper, garlic, ginger, green onion, and jeotgal, a salted condiment made of naturally fermented fish, shellfish, shrimp, oysters, or fish roe. 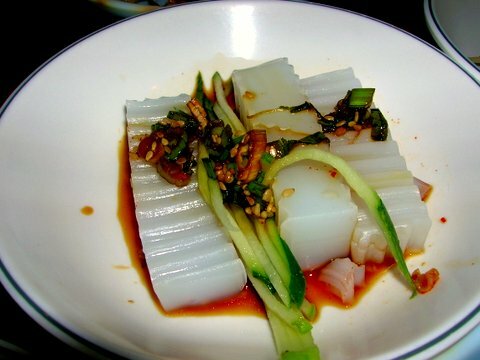 The unique flavor of jeotgal is attained only after the sea creatures are salted and allowed to ferment for at least five months in a cool, airtight environment. Time, however, is what defines kimchi. The complex flavors come from layered lactic acid fermentation, while the jeotgal gives the pickle its undeniable and delicious umami funk. Kimchi is defined by the season and the region in which it was made. 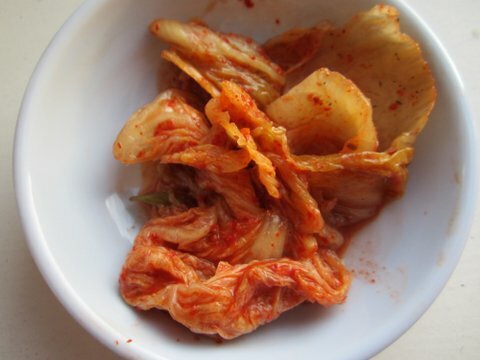 Vegetable varieties, weather conditions, and access to the sea all affect the taste of a kimchi. Although there are micro-climates in Korea, the country’s weather as a whole tends to be much like the city of Chicago, hot and humid in the summer and wicked cold in the winter. The southern provinces tend to use more salt, spice, and seafood, so kimchi flavors are amplified. Meanwhile, northern kimchi tastes less salty and is very mild—like Louisiana gumbo versus New England clam chowder. A Korean table is not complete without kimchi, and I have never been to a Korean restaurant in the U.S. where I wasn’t served at least two types. If nothing else, you will most likely be offered baechu kimchi (whole Napa cabbage kimchi), ggakduki (chopped radish kimchi) and oi sokbaegi (stuffed cucumber kimchi). Namul and muchim are words often used interchangeably. Muchim literally means “mixture,” in this case referring to seasonings and spices. 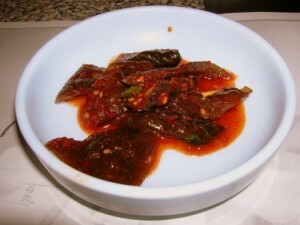 This category does include seafood and beef dishes, but namul is vegetarian only. This type of banchan includes wild greens, a basic side dish for Koreans since 1000 A.D. when Buddhism was the state religion and animal consumption of any kind was banned. Cultivated vegetables and herbs were reserved for the rich and the royal, so everyone else ate naturally-thriving plants. 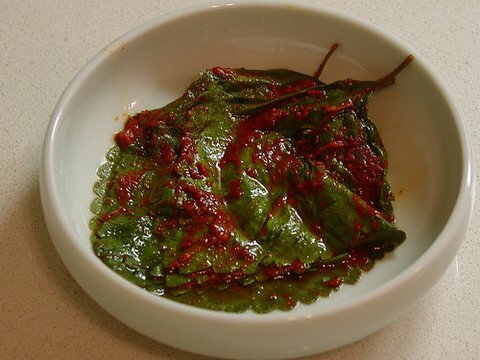 Because more than half of Korean is mountainous, to this day you will often see menu items translated simply as “mountain vegetable” – a term that can be used to refer to roughly 100 types of edible wild greens and vegetables, all of which are called namul. 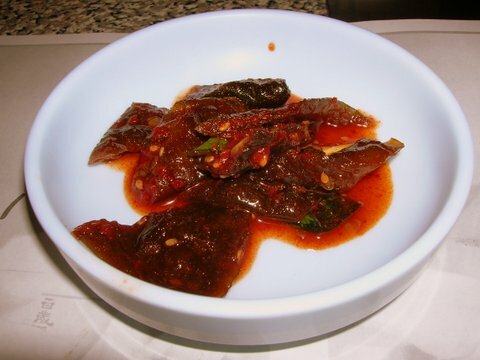 Namul dishes are lightly sautéed or blanched, and come delicately seasoned. 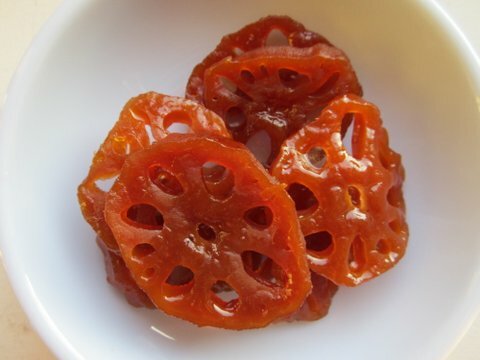 Though they can be spiked with chili, they are usually flavored only with sesame, salt, and garlic. In Korean, jorim means “simmer or boil down.” For these, many ingredients such as fish, seafood, meats, dubu (soybean curd/tofu) and vegetables are seasoned and braised in broth, or simmered with sweetened soy sauce until glazed. Common dishes include jang jorim, hunks of beef ribs braised in soy sauce with green chili peppers and hard-boiled eggs, and soy-simmered, glazed potatoes. Bokkeum are dishes with seasoned, chopped ingredients cooked quickly in hot oil. The wide variety of seasonings used include sesame oil, green onion, soy sauce, garlic, black pepper, sesame seeds, salt, ginger, a little alcohol and pickled fish sauce. Bokkeum as banchan are less common, but mushrooms and dried anchovies show up a quite a few tables around town. These dishes include thinly sliced meats, fish, and vegetables that are either coated in flour, dipped in egg and pan-fried or mixed in batter and fried like pancakes. They are served during ordinary meals and special feasts alike, and are particularly popular as an accompaniment to drinking – to help soak up all the shochu and beer. Some common jeon include potato, prawns, summer squash and spicy beef-stuffed green chili peppers. 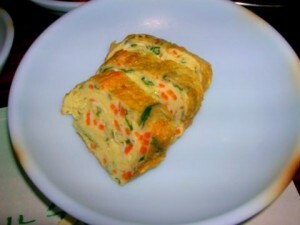 The most recognizable and popular pan fried dish may be pajeon (파전, or green onion pancake), which features endless variations depending on what the cook decides to add to the batter. At least in Chicago, the pajeon and its variants don’t usually come as banchan – hobakjeon (호박전, or fried zucchini disks) is often served instead. A few other banchan types appear on occasion if you’re lucky. Gyeran jjim (계란찜, or steamed egg) is sometimes served, though more often you’ll get a rolled omelette stuffed with some veggie niblets and seaweed called gyeran malyee (계란말이) – if you get eggs at all. 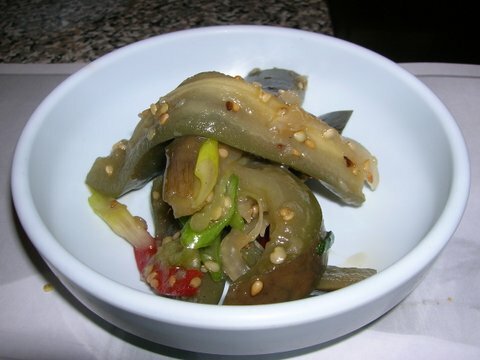 Muk | 묵 is a typical Korean dish made from the starch of buckwheat, mung bean, or acorn. The starch is boiled until thick and cooled into a loaf. Unmolded, the muk blob is an opaque rubbery slab with a neutral taste. You see it often served crinkle-cut so the typical garnish (soy sauce, ginger, garlic and chile) has somewhere to pool. 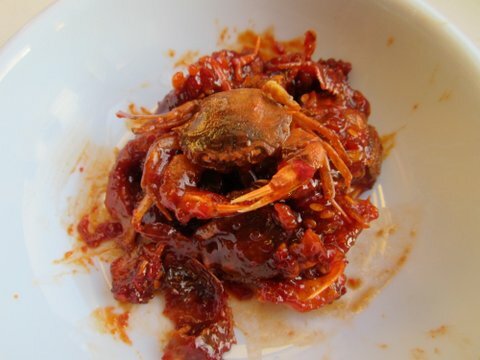 Like kimchi, muk is both regional and seasonal, so many different varieties appear. Hearty buckwheat muk is best served in the winter and is historically a late-night drinking snack. Dotorimuk (acorn) is best during mid-summer, while cheongpo (mung bean) muk is a spring dish. With modernization, muk has lost its seasonal aspect over the years. So while there are endless variations of banchan, it’s easier to wrap your head around these small dishes if you think about them in terms of how they are prepared: fermented (kimchi), lightly sauteed, braised, pan-fried, stir-fried or steamed. 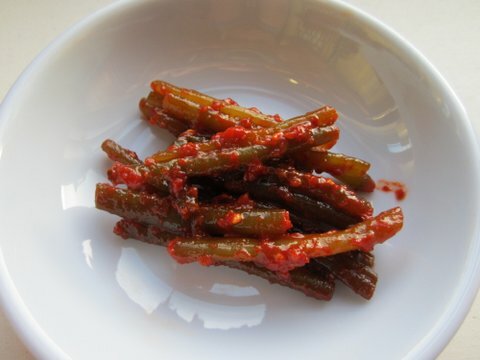 And, if you ask for a little more of something by its Korean name, you can enjoy more of your favorite banchan. Maybe you’ll even experience the thrill of receiving an approving nod from a stern ajumma!